At this site I have previously profiled several pro-Assad militias, such as theMuqawama Suriya, the Coastal Shield Brigade and Dir' al-Watan. Below are profiles of five more pro-Assad militias. Emblem of Liwa Suqur al-Quneitra: 'Quwat Dir' al-Watan' (Homeland Shield Forces). Translating to 'Quneitra Falcons Brigade', this formation appears to comprise local pro-Assad militias to support the Syrian army in the remaining regime-held parts of Quneitra governorate, such as al-Ba'ath city. The existence of this force is acknowledged in pro-regime media outlets like Sama TV, issuing reports on the continued defence of al-Ba'ath city against the rebels. The origins of Liwa Suqur al-Quneitra trace back to its most famous 'martyr': Fadi al-Haj, also known as Abu Sakhr, depicted in the graphic below. They are sons of Quneitra who bore arms since the beginning of the war in Syria and their arms were against all who wanted to enter their villages from all sides, even the state, but then the terrorist threat to the area intensified and terrorist factions entered, supported by Israel. They rejected coordinating and cooperating with them, and asked the Popular Defence leadership to incorporate them into their forces to defend Quneitra. They participated in all the battles and were at the head of the lance up to the fence of the occupied Golan. They formed Liwa Suqur al-Quneitra and called on the youth of the area to enlist and train to fight. And indeed hundreds joined among fighters and supporters. The Syrian Arab Army leadership armed them with different types of weapons- light and heavy- including anti-tank missiles and rocket launch systems. 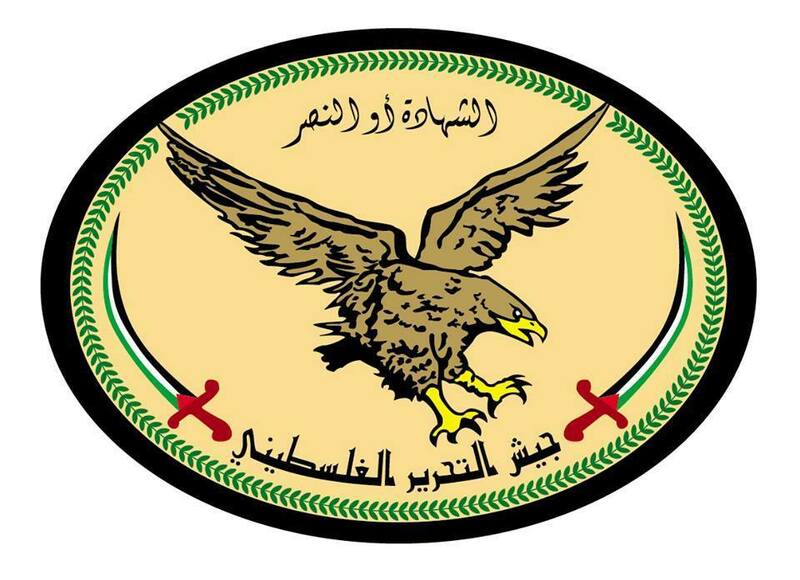 The Quneitra Falcons have participated in the war against terrorism in Quneitra governorate. And since they are sons of the land, they have managed to carry out military penetrations within the ranks of the terrorists, and have infiltrated to the hearts of their areas and carried out precise operations. – Resisting the terrorists' attack on Tel al-Qab'a from the side of the locality of Ufania. – Participating in the liberation of the locality of Deir al-Ads in the Quneitra countryside. – Blowing up and dismantling a number of terrorist sites and bases through intermittent stages in time, according to their expertise in the nature of the land of the battle in all that is the surrounding of the village of Umm Batina, Mashara and Tel Karum- Jaba. – Destroying the dangerous terrorist Abdo al-Qarfa'i who led a terrorist cell in Kafr Nasij. – Targeting the terrorist groups on a daily basis in the village of Mashara, the village of al-Hurriya, the village of Shabta, and al-Hamidiya. – Assaulting the village of al-Ajraf, dismantling and blowing up the terrorists' dens. – Resisting the terrorist groups' attack and destroying their vehicles in al-Hamidiya. – Seizing weapons' caches and ammo including American-made anti-tank missiles. – Seizing the village of Rasm al-Baghal in the Quneitra countryside. – And yesterday they resisted a great terrorist attack on al-Ba'ath city, routed and caught the attackers in a counter-attack on their dens in the locality of al-Samdaniya al-Gharbiya, aided by all of artillery, missiles and tanks." 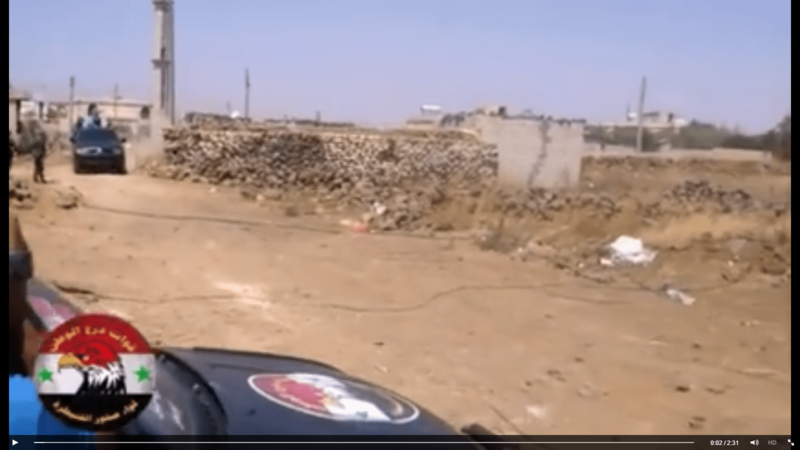 In this Liwa Suqur al-Quneitra video, the group's insignia can be seen on the vehicle. 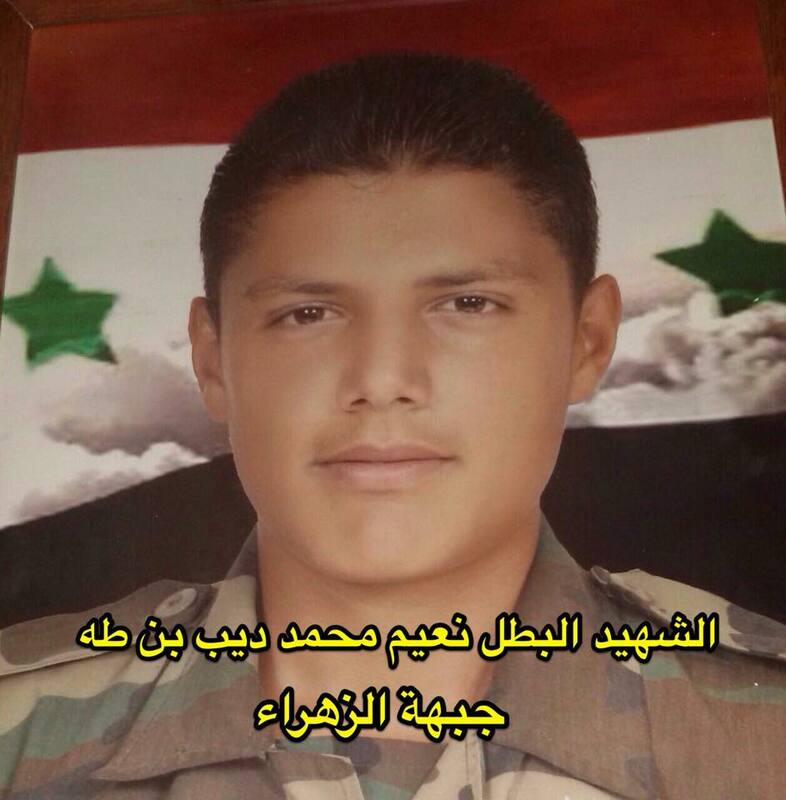 The above photo is of Muhammad Haymoud, announced as a 'martyr' for Liwa Suqur al-Quneitra on 31 July 2015. 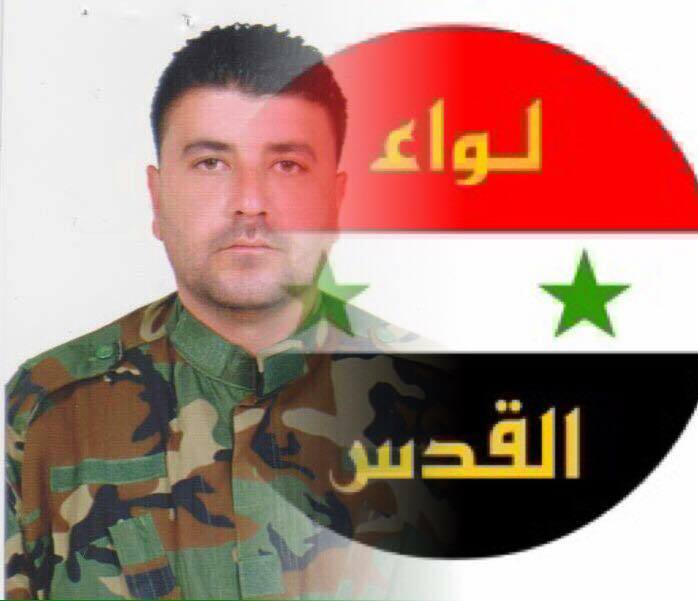 The story of his death according to Liwa Suqur al-Quneitra in a post dated 2 August 2015 is most interesting: "He was killed at the hand of an armed group from the Ba'ath Brigades [another pro-Assad militia] as the group set up a treacherous ambush while he was moving from Khan Arnabeh to al-Ba'ath city when the group struck his car with two RPG rounds and after that light gunfire on his car in front of the eyes of the people. Although a number of people tried to provide first aid to the martyr, it was not long before he stammered that live gunfire was unleashed on these people, forcing them to move away. And the leader of the group is called Jaber al-Khalid and his brothers. This is the truth of the assassination of the heroic martyr." The fighting in Quneitra province remains at an overall stalemate as rebel forces including Jabhat al-Nusra and Ahrar al-Sham fail to take any more regime-held areas, including most notably the staunchly pro-Assad Druze village of Hadr. Local support for the regime arguably remains the most crucial factor in holding back the rebels. At the same time, the regime lacks offensive capability here even when backed by foreign forces, as was the case with the failed Deraa-Quneitra offensive earlier this year that featured heavy involvement from Iranian-backed militias including theAfghan Shi'a Liwa al-Fatemiyoun and the Iraqi Kata'ib Sayyid al-Shuhada'. "A new organization has appeared alongside the Syrian army in Aleppo fighting the armed takfiris, for after the entry of Hezbollah onto the line of battle and the appearance of 'Quwat al-Ridha', which is considered the core of Syrian Hezbollah, in addition to the National Defence Forces and the Iraqi military formations, a Palestinian faction has appeared fighting under the banner of the Syrian state. Information indicates that the new formation adopted the name of the Palestinian capital al-Quds as its banner, while it is formed of Palestinian fighters who have lived and live in Syria, having expressed their support for the Syrian state and its army. The formation, which was established in October 2013 by the engineer 'Muhammad al-Sa'id' who is considered its real leader, held the bond of silence and thus its activities were not advertised in media, until the recent battles of north Aleppo countryside where an important military role for them became apparent. This is also clear on the 'al-Nayrab' camp front where through frontline duty the formation's fighters face the takfiri fighters who are besieging the Palestinian camp. 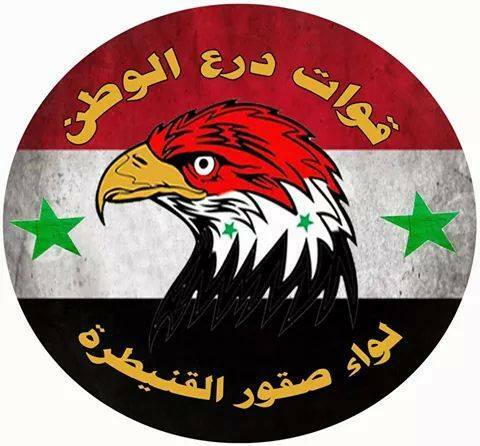 The formation's fighters who call themselves the 'Syrian Arab Army Fedayeen' are distributed on the periphery of the camp and south of al-Nayrab military and civil airport. They are also present in Aziza village, Sheikh Latfi, and around the Air Intelligence building and the Greatest Messenger mosque. They are also greatly active as a strong force on the first al-Rashadeen front ablaze in west Aleppo. This front is considered among the most dangerous and difficult fronts, with protection of this front entrusted entirely to Liwa al-Quds. In addition to these fronts, the brigade is present in the village of Haylan, and west of Aleppo central prison, around Handarat camp, and in a number of areas south and east of Aleppo, as well as in Jama'ia al-Jud south of the two besieged villages of Nubl and Zahara. The brigade is composed of three main battalions, which are: Lions of al-Quds Battalion, which operates in al-Nayrab camp and its surrounding as well as in southern and eastern countryside; the Deterrence Battalion, which operates in the north Aleppo countryside south of the villages of Nubl and Zahara; and the Lions of al-Shahba' Battalion, which operates on the fighting fronts inside Aleppo city. According to information, among the brigade's successes are protecting al-Nayrab camp, 'the only camp that has not been penetrated', protecting the civilian and military airport, as well as the missiles base south of the camp. And on the walls of the camp the victories of 'Liwa al-Tawheed' have been broken and its defeat has begun. A commander in the brigade estimates the number of wounded since the beginning of the events at more than 400, and the number of martyrs at more than 200, the majority of whom have fallen on the blazing fighting fronts, which are considered to be the air intelligence building front as the most prominent. Meanwhile he estimates the number of battles Liwa al-Quds members have waged alongside the Syrian Arab Army since its establishment until now at more than 140 battles." To be sure, pro-regime militia activity in the al-Nayrab camp was not unknown before the formation of Liwa al-Quds. Already the familiar Popular Committees had taken root there, with the first 'martyr' reportedly being Hussein al-Masri, who was killed on 26 September 2012. 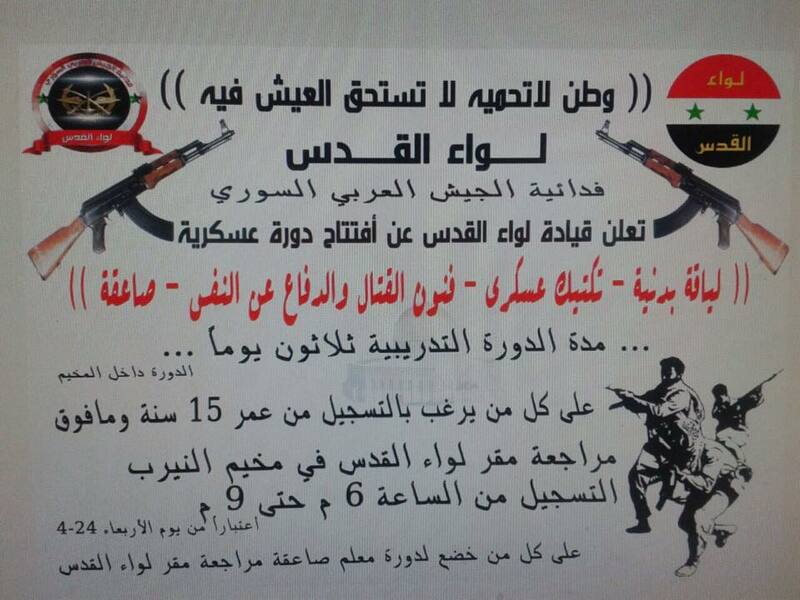 In any case, a number of 'martyrs' have been advertised officially by Liwa al-Quds, as per the photos below. Omar Qarmazi, whose death was announced in August 2015. He died of his wounds from fighting in the Zahara' area. 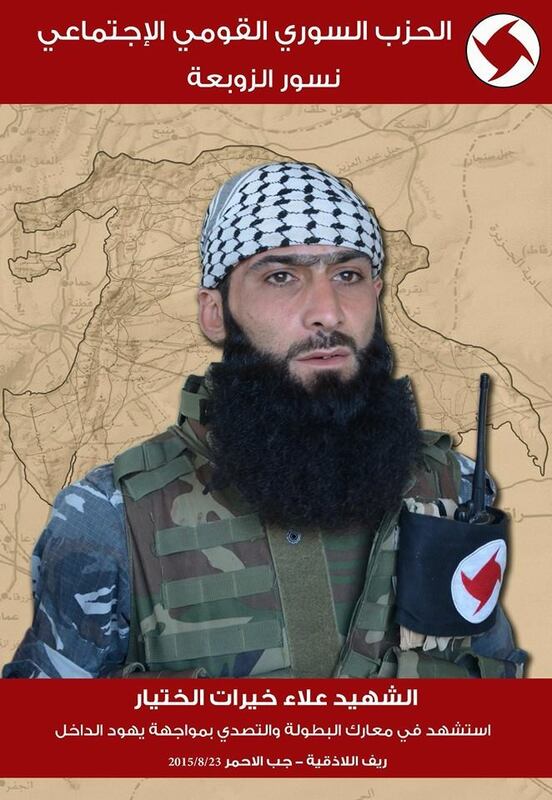 Kamal Yusuf As'ad, originally of the al-Raml camp in Latakia: his death was announced in June 2015. 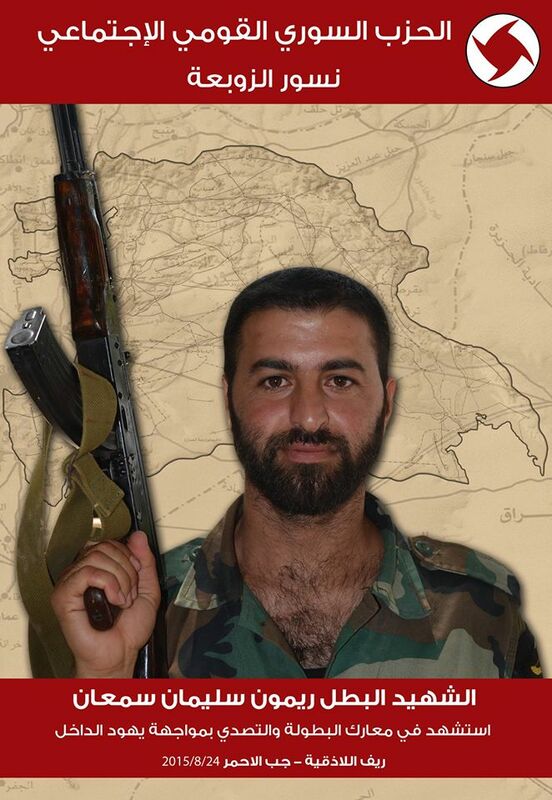 Before dying in Mahambal in Idlib province, he most notably fought on the Handarat front. Muhammad Nadhir al-Junaid, who died on 29 May 2015 apparently from drowning in tidal waves in Latakia, where he had been dispatched on assignment by the leader of Liwa al-Quds. He had previously fought on the first al-Rashadeen front. 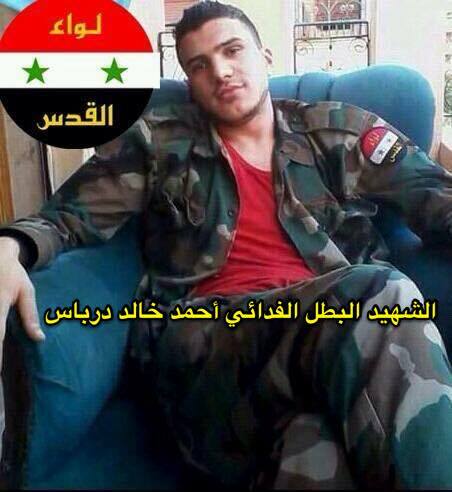 Nu'aim Muhammad Dib bin Taha, who died fighting on the Zahara front. 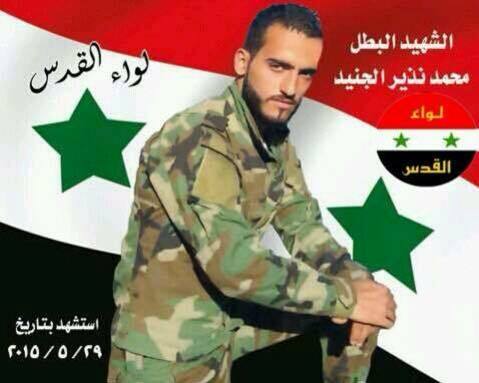 Two of his brothers (Muhammad and Basil) died fighting for the Syrian army in the Aleppo area. 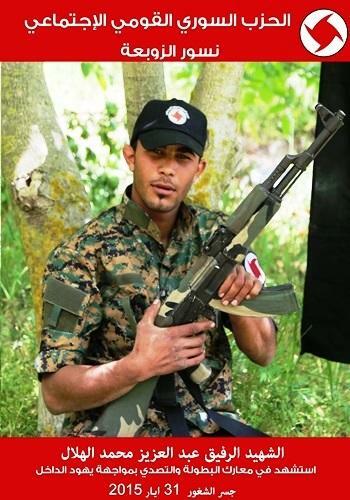 Ahmad Khalid Dirbas: killed in July 2015. Note his Liwa al-Quds insignia. Besides military operations, Liwa al-Quds also engages in social outreach and offers military training sessions. 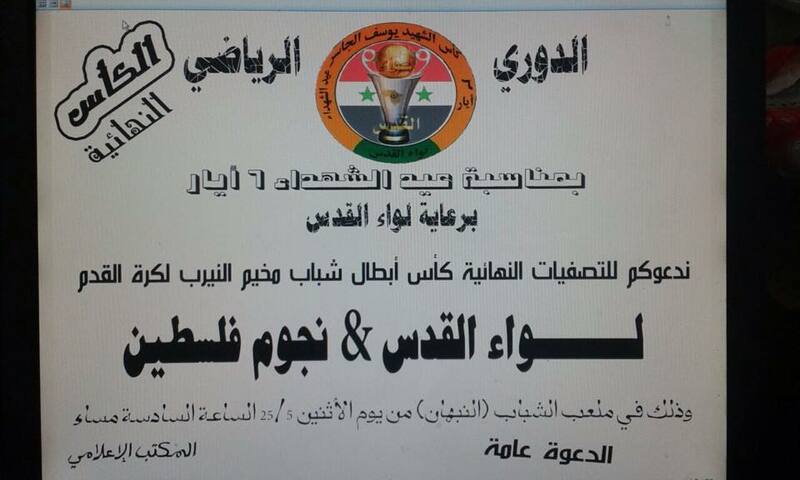 On the former, from May 2015, note the invitation below to attend the final of a soccer tournament in the Nayrab camp. "In relation to Martyrs Day on 6 May, under the supervision of Liwa al-Quds, we invite you to the final round of the al-Nayrab Camp Youth Heroes Soccer Cup : Liwa al-Quds vs. Palestine Stars. And that will take place in the Youth stadium (al-Nabhan) on Monday 25 May, at 6 p.m. General Invitation. The Media Office." As for military training, note the advertisement below put out by Liwa al-Quds in April 2015. "The Liwa al-Quds leadership announces the opening of a military session: physical fitness, military tactics, martial arts and self-defence, blitz. The length of the training session is 30 days. All who wish to register from age 15 and above should head to the Liwa al-Quds base in the al-Nayrab camp and register from 6 p.m. till 9 p.m., beginning from Wednesday 24 April. All who are subjected to the session of the blitz teacher should head to the Liwa al-Quds base." 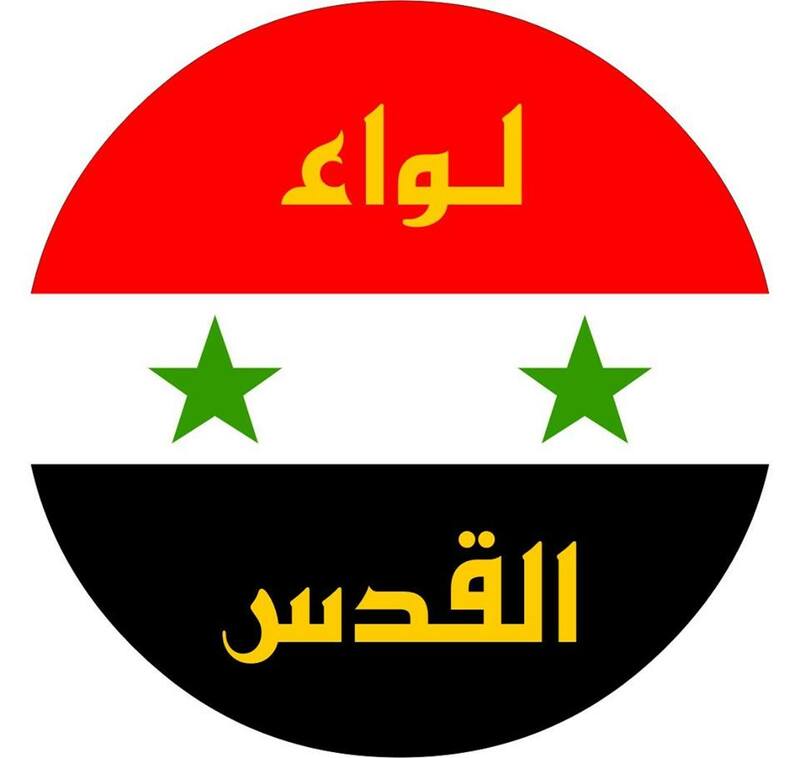 Emblem of Jaysh al-Tahrir al-Falastini. On top: "Martyrdom or Victory." Jaysh al-Tahrir al-Falastini is the 'Palestinian Liberation Army.' This militia in Syria is led by one Muhammad Tariq al-Khadra', who characterizes the civil war in Syria as follows: "The vicious barbaric international conspiracy against Syria and the Arab nation aims to redivide and repartition this nation to form weak madhhabist, sectarian and racist entities in conflict with each other, to justify the establishment of the racist entity on the Jewish foundations of the Zionist state, dominating over the Arab nation." Jaysh al-Tahrir al-Falastini has fought in a variety of engagements over the years, such as in Adra in the Damascus area and more recently (April 2015) in northern Suwayda province, where the group lost 13 fighters. Other recent battles includeDarayya in the Damascus area, Tel al-Sawan on the peripheries of Douma in the Damascus area, the siege of Moadhamiya al-Sham, and perhaps most controversially, the ongoing assault on rebel-held Zabadani, as per the screenshot from the video below. "From the heart of Zabadani: the road of al-Quds. 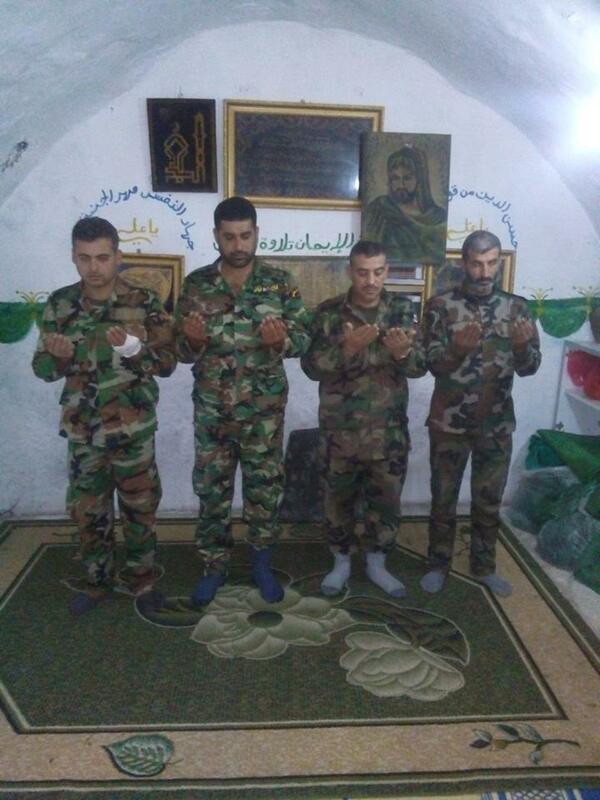 The Men of Jaysh al-Tahrir al-Falastini." Indeed, Jaysh al-Tahrir al-Falastini claimed last month a 'martyr' in the Zabadani battles: Muhammad Ali Saba'i, originally of the Handarat refugee camp of Aleppo province. In total, according to the same report, an opposition advocacy group for Palestinians in Syria has documented 142 Jaysh al-Tahrir al-Falastini 'martyrs' in Syria. 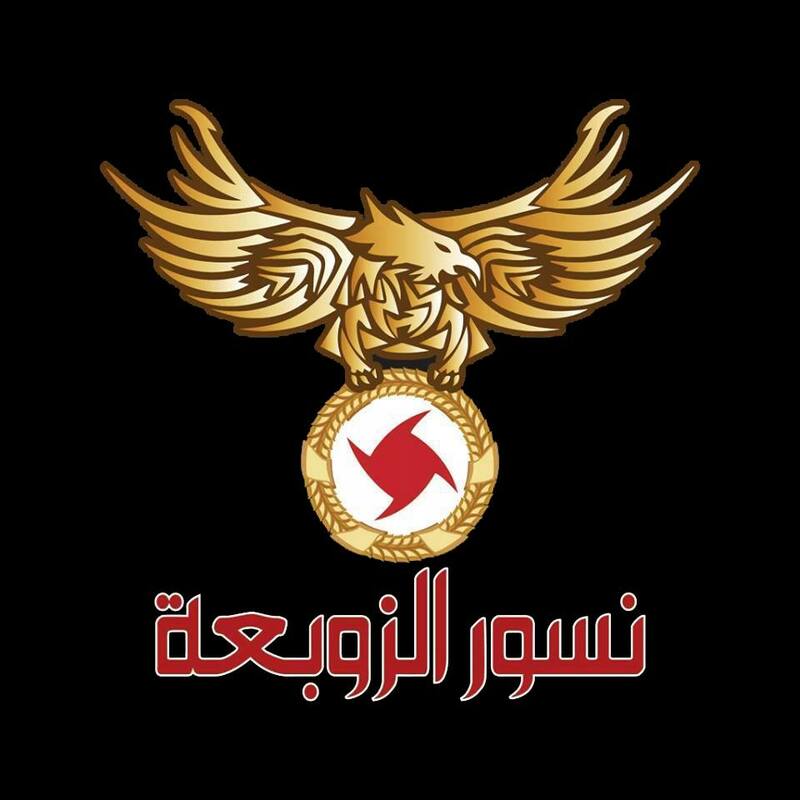 Nusur al-Zawba'a translates as 'The Whirlwind's Eagles', referring to the whirlwind/vortex logo of the Syrian Social Nationalist Party (SSNP). Of all the militias documented here, Nusur al-Zawba'a seems to have fought in the largest number of engagements, spanning the range of western Syria. The SSNP's involvement in the Syrian civil war has already been documented to a considerable extent before. For instance, the SSNP has built noteworthy support bases in Homs' Old City, the Christian villages of Wadi al-Nasara area and Latakia. It also works alongside other pro-regime factions in Suwayda province. This is so even as strictly speaking, the SSNP's Greater Syrian nationalism is not compatible with Ba'athist Arab nationalism. Sometimes, there is overlap between the SSNP and the regular Syrian armed forces. This entry on Nusur al-Zawba'a explores some sample 'martyrdoms' and the manner of characterization. An invitation from the SSNP, the family of the 'martyr' Nasri Estefan Injil and others to attend departure prayers for the 'martyr' at 11 a.m. on 29 August 2015 in the Mar Yohanna al-Ma'amadan church in the Wadi al-Nasara locality of al-Qalatiya, with further condolences to be offered from 30 August-1 September 2015. The opening quotation at the top is from the Gospel According to John (11:25): "Whoever believes in me, even though he dies, shall live." 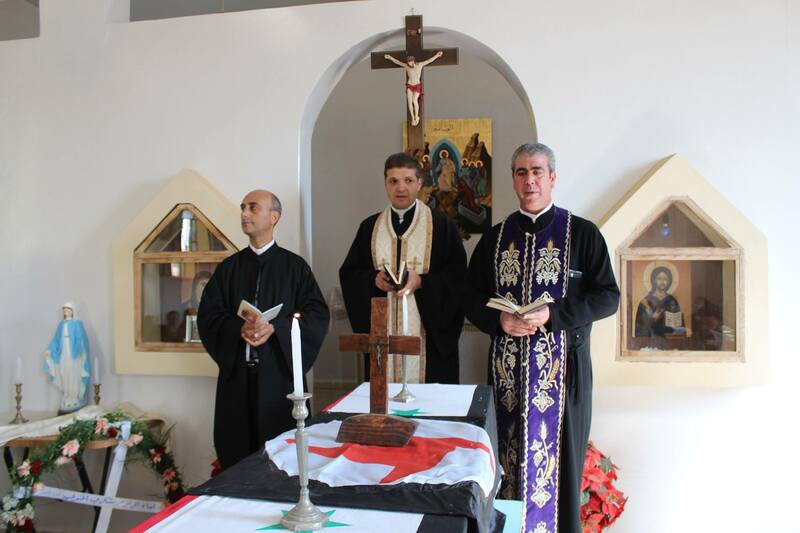 The SSNP has made particular shows of solidarity with Christians, so its appeal should not be surprising, particularly in western Syria where it seems to offer the only alternative to Arabism, whereas in thenortheast of Syria non-Arab Christian-specific identities- most notably Assyrian and Syriac- have established a much stronger foothold. 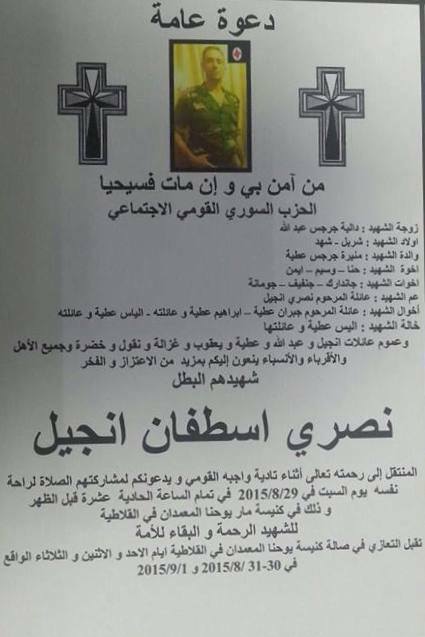 Raymun Suleiman Sam'an, of the Christian village of Rabla near Qusayr. 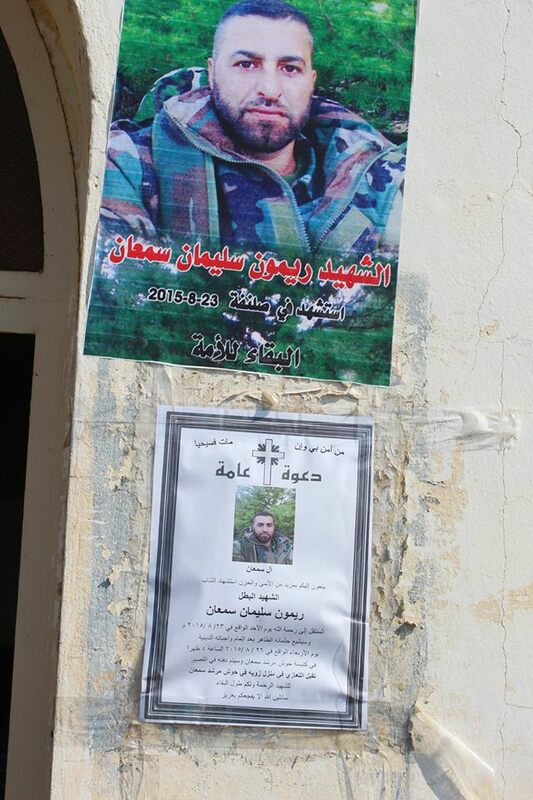 According to the poster above, he died fighting in Slanfeh in Latakia on 23 August 2015. Account of funeral proceedingshere. The Nusur al-Zawba'a announcement of Raymun's 'martyrdom' differs slightly in putting the date of his death on 24 August 2015 in Jabb al-Ahmar, Latakia. As this graphic puts it: "He was martyred in the battles of heroism and resistance in confrontation with the internal Jews." The phrase "internal Jews" (yahud al-dakhil) deserves comment here. As my friend and colleague Carl Yonker notes, this language is tied to SSNP founder Antun Sa'adeh's argument that the Jews could not constitute a part of the Greater Syrian nation, as Zionism posits an independent Jewish state in the Israel-Palestine area, while SSNP Greater Syrian nationalism requires these lands to be part of Greater Syria. Ala' Khayrat al-Khatyar, who according to this Nusur al-Zawba'a announcement also died fighting the "internal Jews" in Jabb al-Ahmar, on 23 August 2015. His biographystates that he was born in 1988 in Bayt al-Haj, Tartous. 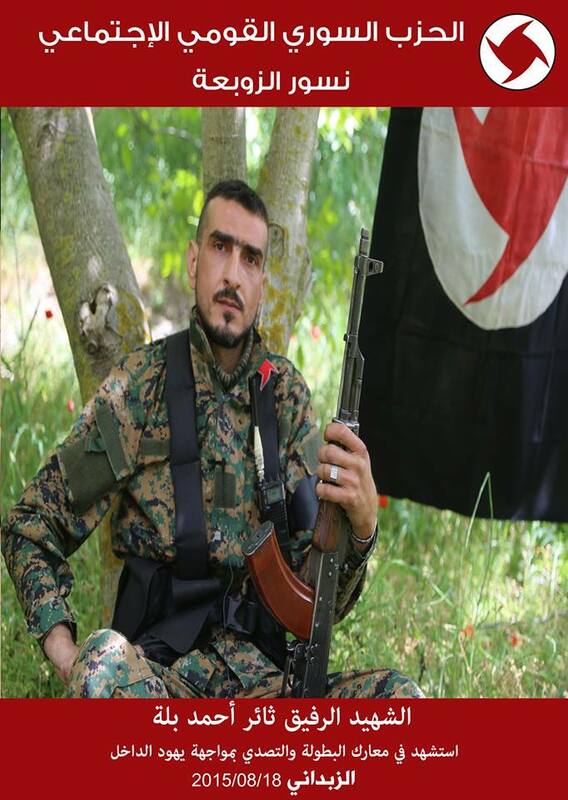 He joined Nusur al-Zawba'a in 2012, and participated in a number of battles, "from Kassab [Latakia province], to Homs, al-Zara [Homs province], Sadad [Homs province], Mork [Hama province], Taldara [Hama province], Sahl al-Ghab [Hama province], Tallat Khattab [Idlib province] and others besides these." Tha'ir Ahmad Bala, who according to this Nusur al-Zawba'a announcement died on 18 August 2015 in Zabadani. According to his biography, he was born in Latakia in 1978 and joined the SSNP in 2003. His most notable engagements include Kassab, Sadad, al-Zara, Quneitra, Saidnaya [Damascus province], Ma'loula [Damascus province], Mork and finally Zabadani. 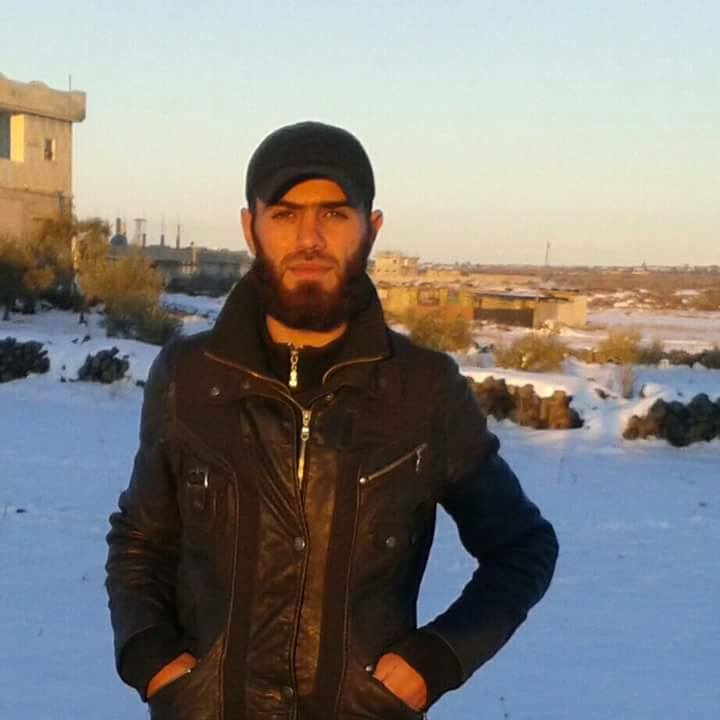 Abd al-Aziz Muhammad al-Hilal, declared to have been killed in Jisr al-Shughur on 31 May 2015. His biography states that he was born in 1993 in Kharufia Kabir, which is in the Manbij area of Aleppo province currently controlled by the Islamic State. His most notable engagements include Kessab, Mork, Hisn [Homs province], al-Nabk [Damascus province], Sadad, al-Zara & finally Jisr al-Shughur. 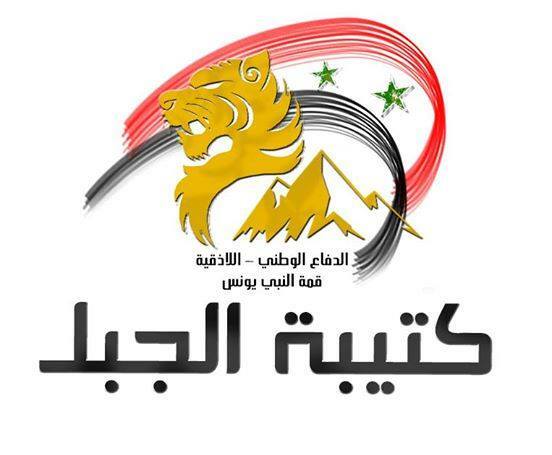 Emblem of Katibat al-Jabal: "National Defence: Latakia: Nabi Yunis Summit." Katibat al-Jabal means "The Mountain Battalion" and a division of the National Defence Forces in eastern Latakia province. Nabi Yunis lies to the north of Slanfeh. As its affiliation suggests, its role is defensive in nature, to prevent further rebel and jihadist pushes into Latakia province- a prospect that increasingly looms large with the regime losses in Idlib province. 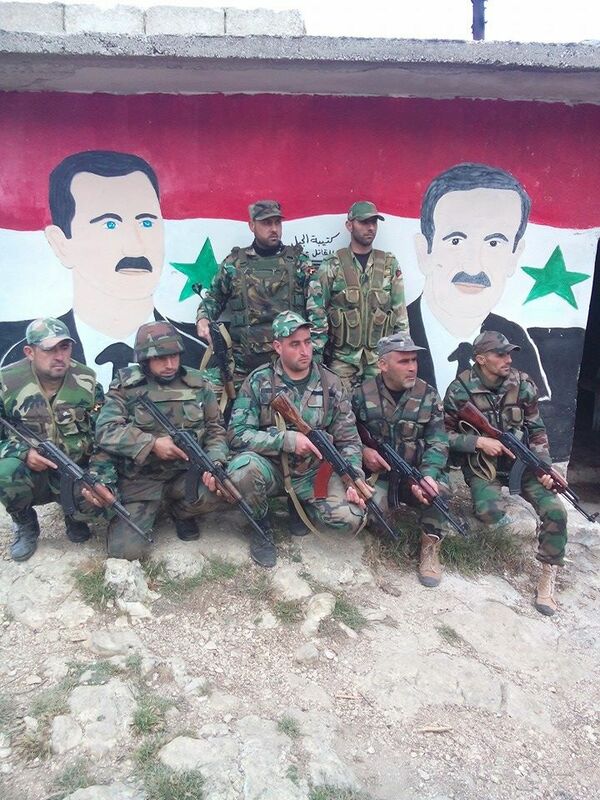 Members of Katibat al-Jabal pose in front of a mural of Bashar and Hafez al-Assad, which bears the inscription "Katibat al-Jabal". Alongside this uploaded photo,Katibat al-Jabal offered a message of solidarity to Jabal al-Arab [Jabal al-Druze in Suwayda province] in June 2015, as both Suwayda and Latakia provinces faced the threat of rebel and jihadist encroachments. 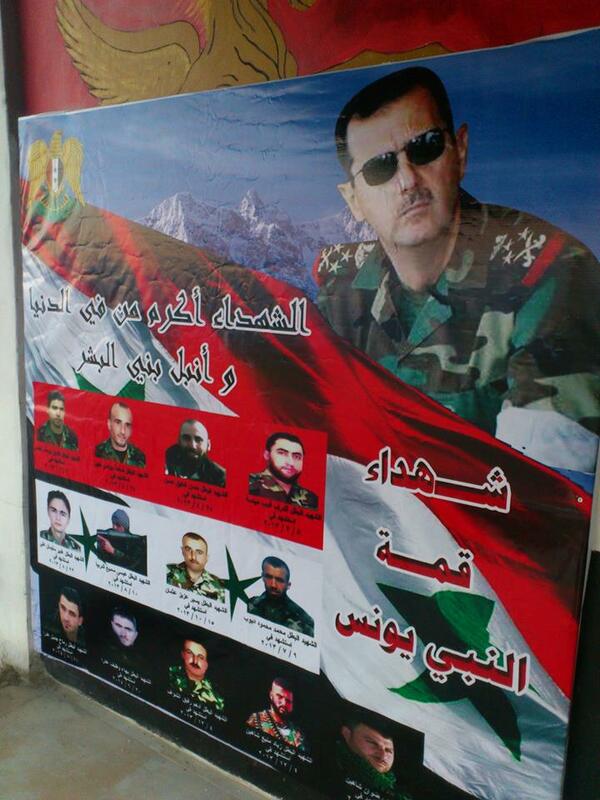 Poster from 2014 dedicated to the 'martyrs' of Katibat al-Jabal. Photo released by Katibat al-Jabal during Ramadan 2015. The picture of Imam Ali on the wall and the inscriptions of "Ya Ali" (Oh Ali) should make clear the group's Alawite membership.